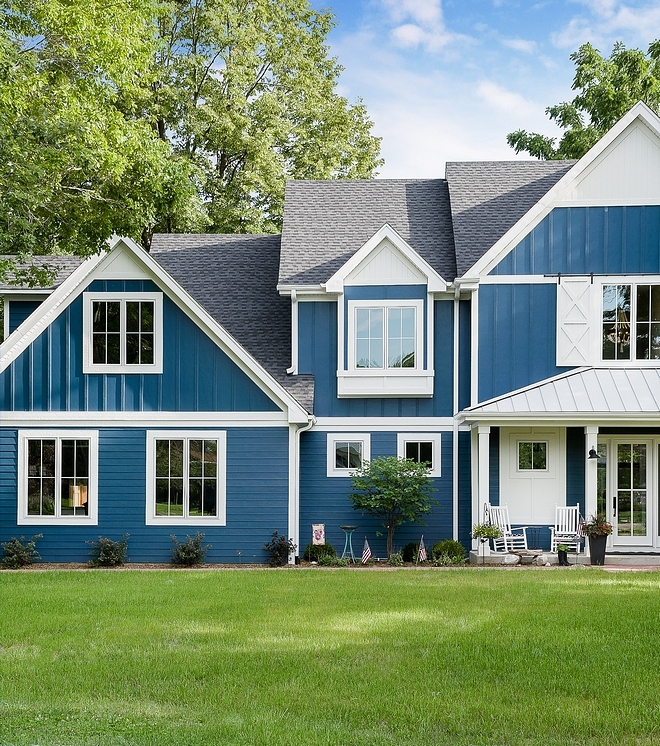 Undoubtedly, modern farmhouse is by far the most popular home style these days. 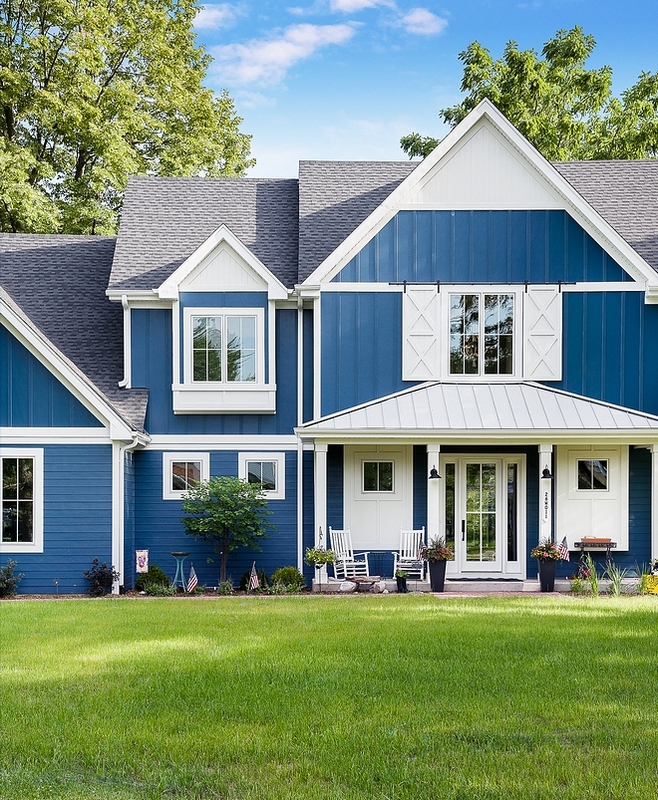 We have seen many modern farmhouses with white exteriors, Joanna Gaines-inspired farmhouses, new-construction modern farmhouses, board and batten modern farmhouses and more recently, a modern farmhouse with black and white interiors, but a modern farmhouse with blue exterior is something new to me, and, just between you and I, it feels very refreshing! 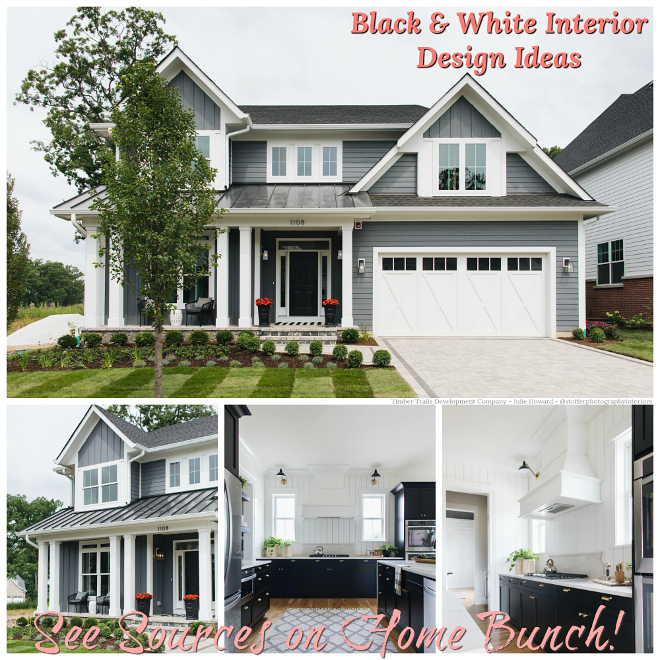 Take notes on this beautiful home built by one of my favorite builders, M House Development (previously featured here), and make sure to pin these inspiring home decor pictures! 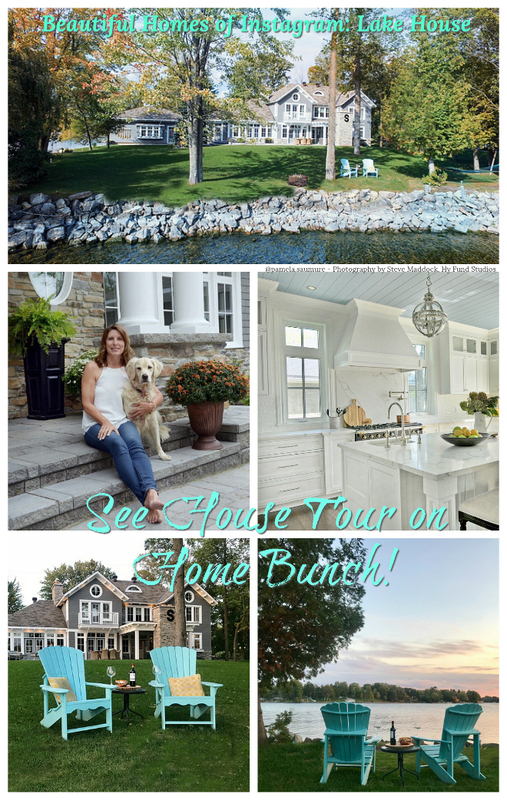 This is the kind of home that makes you turn your head if you’re walking by! What a curb-appeal!!! 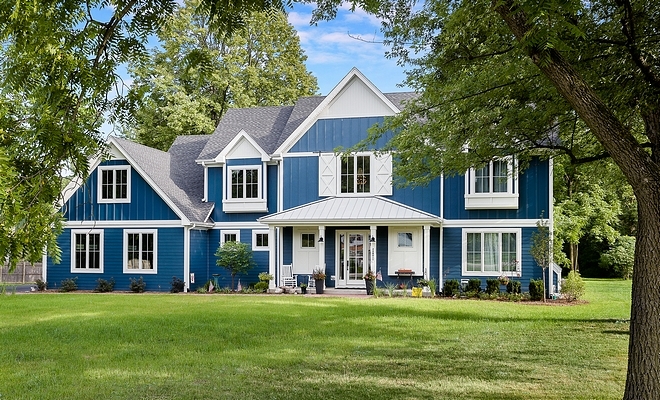 The exterior paint color is Sherwin Williams SW 6230 Rainstorm. The home combines shingle roof and metal roof. 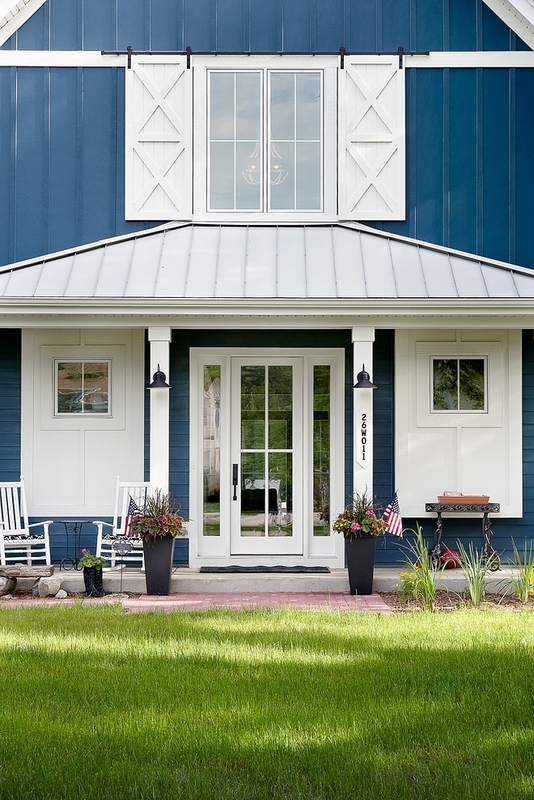 This is a very popular combination for modern farmhouses. 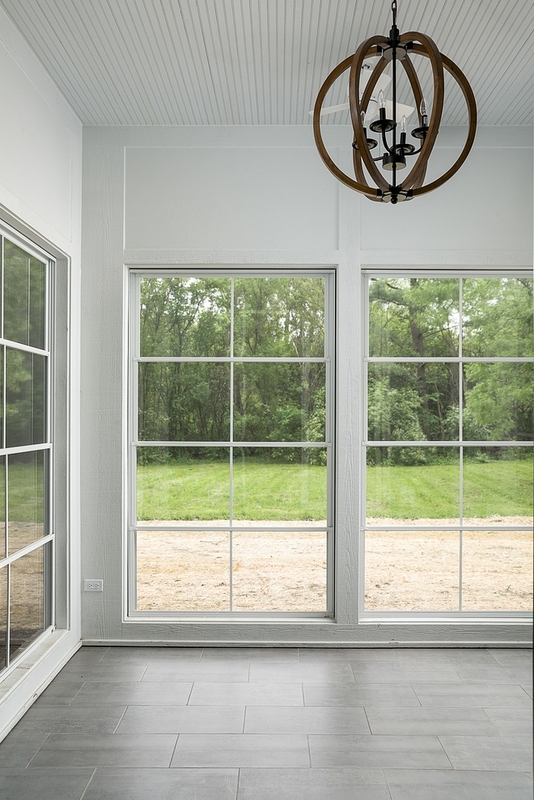 One of my favorite things about this home, besides the stunning architectural details, is the custom “barn door-inspired” shutters. 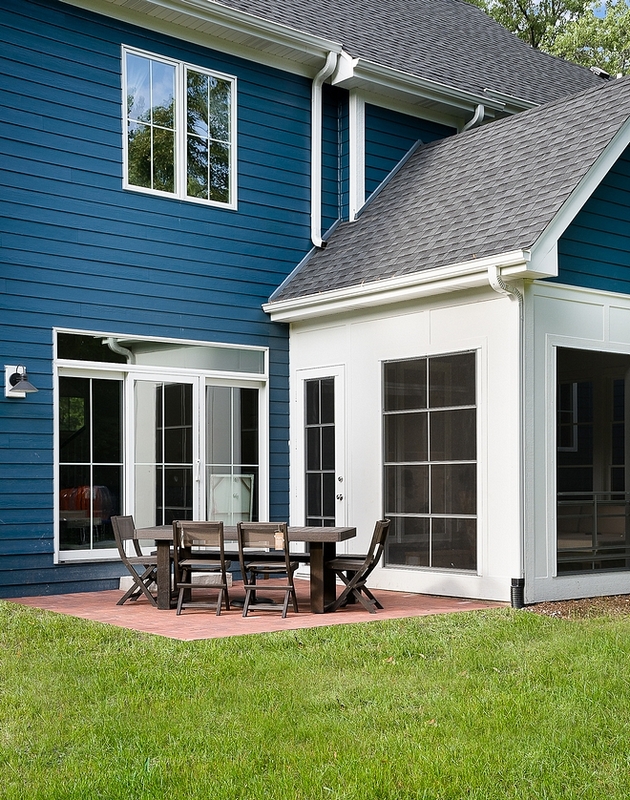 The exterior trim paint color is Benjamin Moore White Dove. 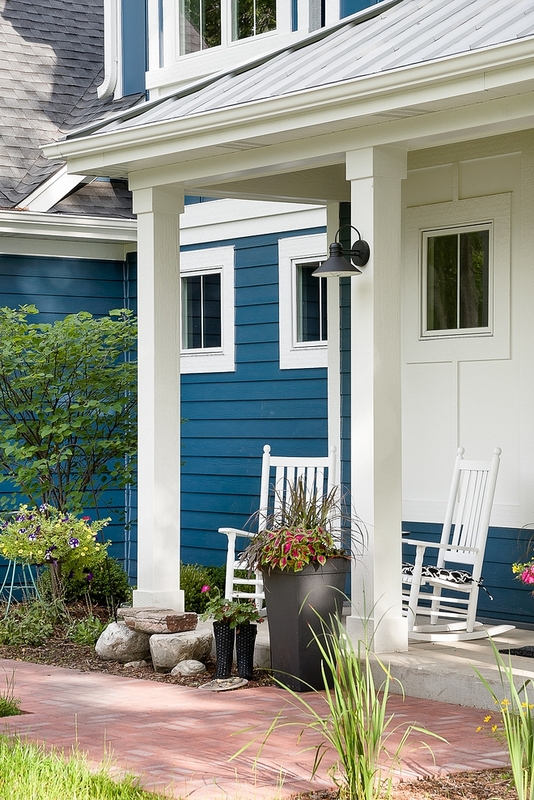 A front porch always adds so much to the curb-appeal to a home. 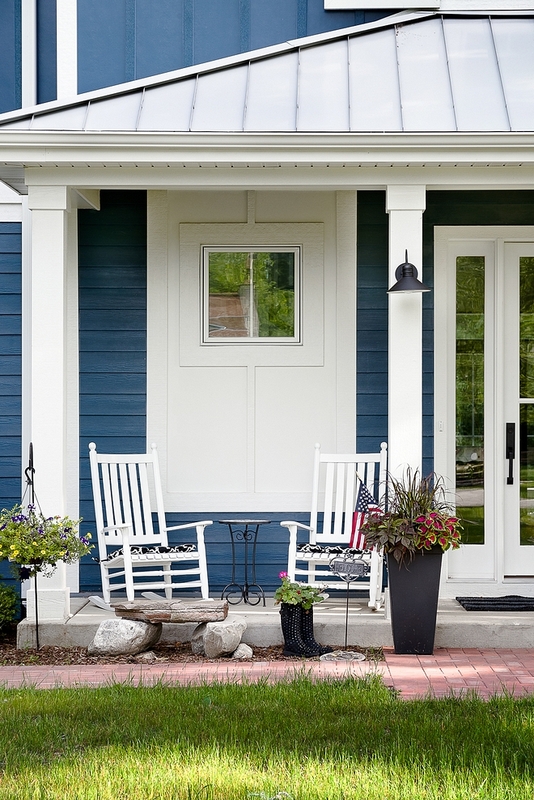 In fact, I don’t think I ever disliked a home with a front porch. 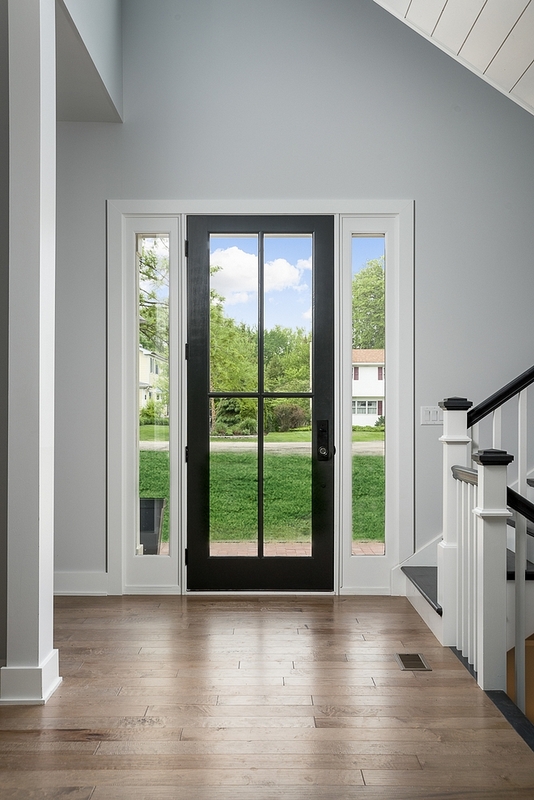 A glass front door with sidelights is flanked by two windows with custom board and batten trim. 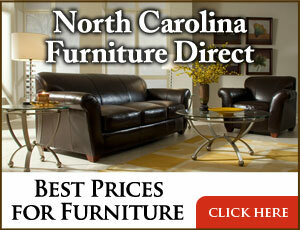 Although not completely furnished, this home features many great interior design ideas. Paint color is Sherwin Williams SW 7070 Site White. 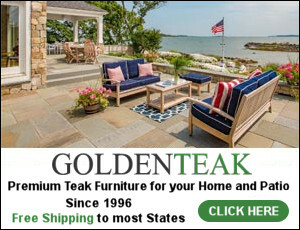 Hardwood throughout house: Engineered hardwood, Shaw Floors Fairbanks Maple 5 Gold Dust. 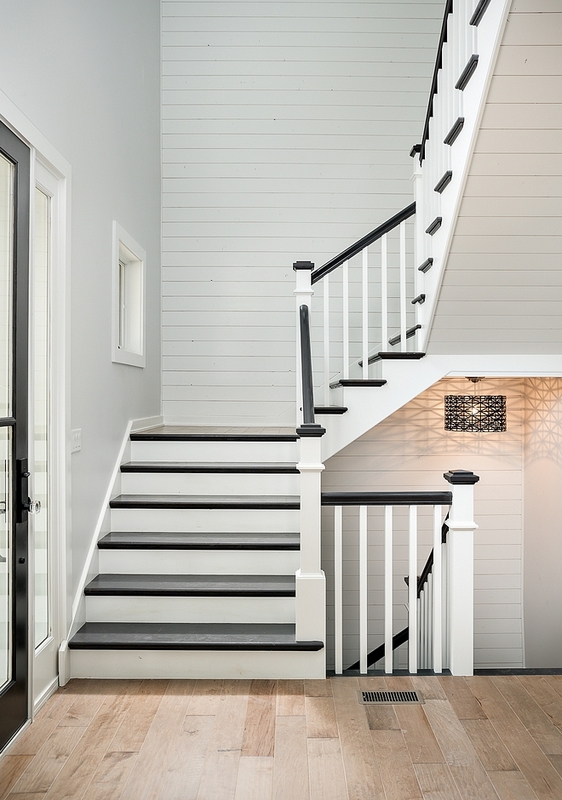 Shiplap was installed, not only on the wall, but also as paneling on the bottom of staircase. This gives a seamless look to the entire space. 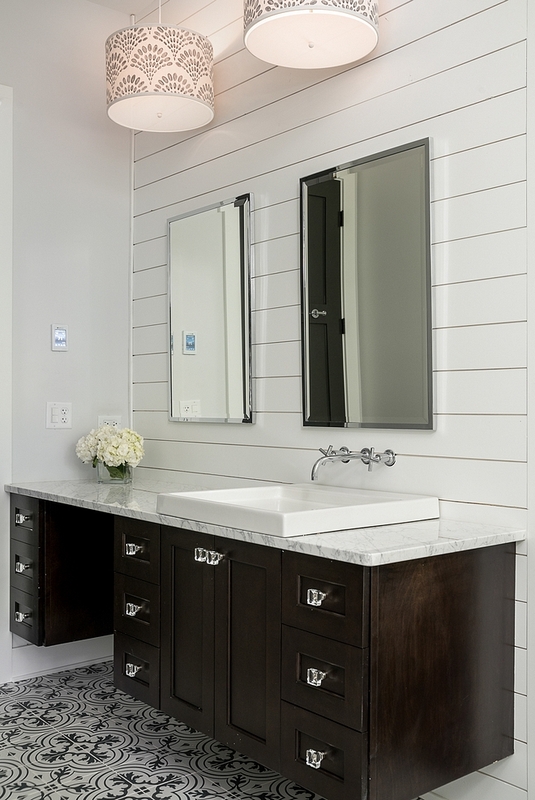 Shiplap paint color is White Dove OC 17 Benjamin Moore. Railing and front door ares painted in SW Peppercorn. 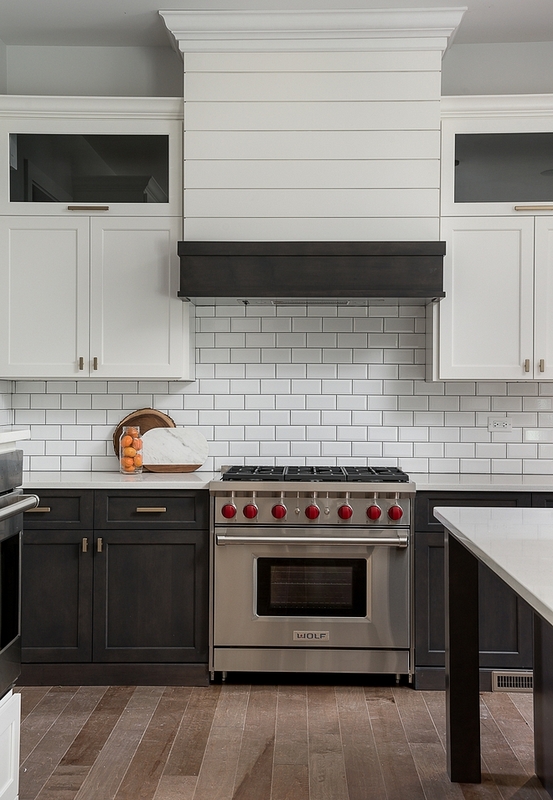 This is a great way to design a “two-toned kitchen” while keeping everything neutral. 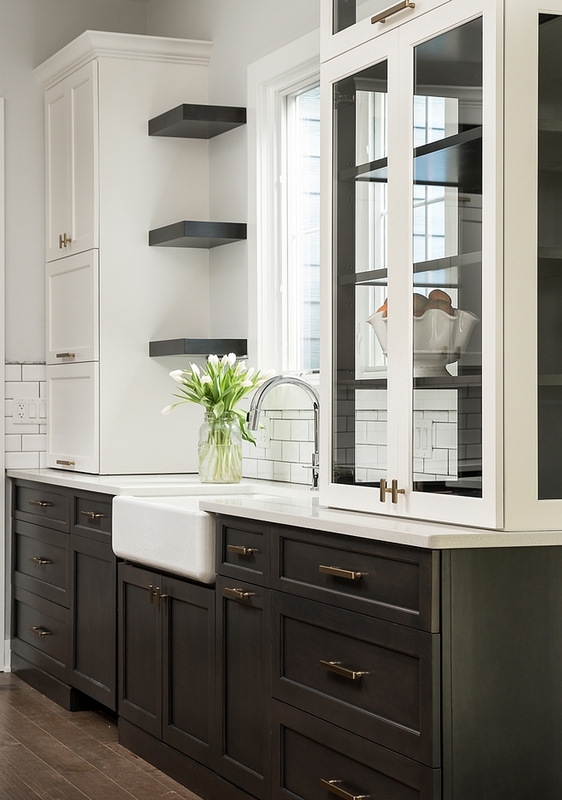 The upper cabinets are painted in White Dove OC 17 Benjamin Moore. 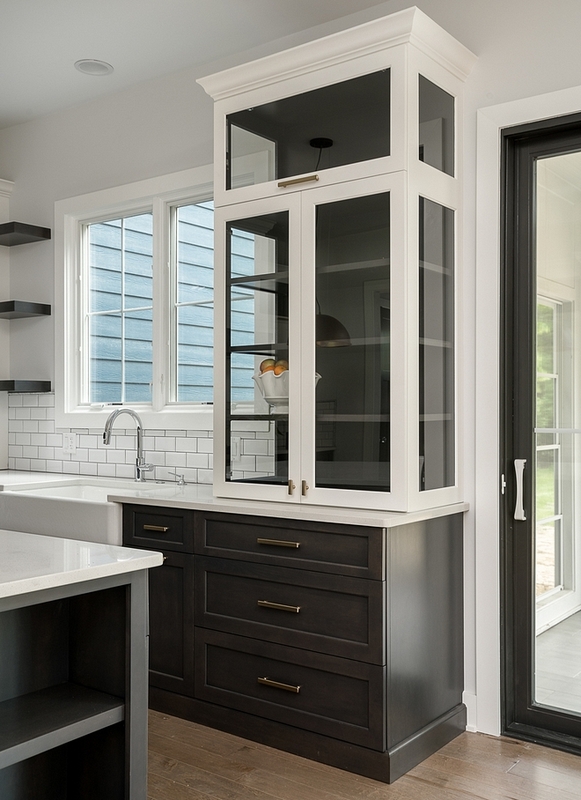 A well-designed appliance garage is found on the left, just above the bread compartment. This is the ideal place to hide the toaster. Also, notice the electric outlet inside the cabinet. 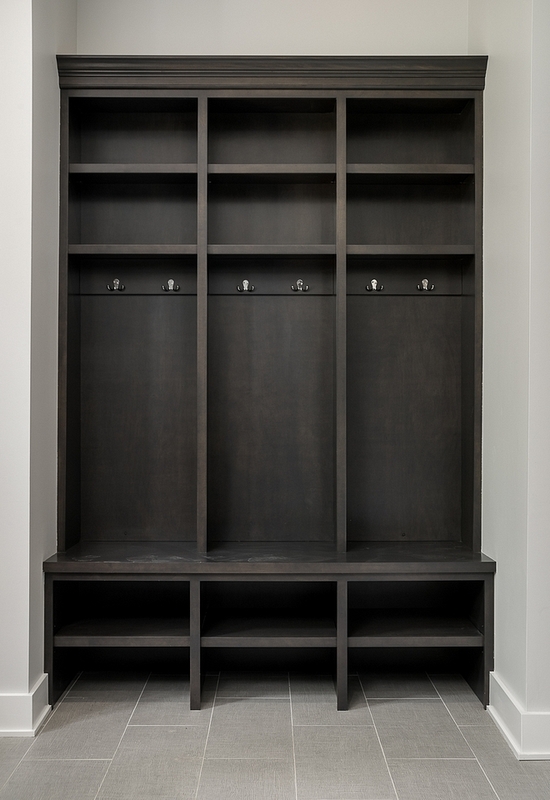 The lower cabinets are Maple, stained Phantom. 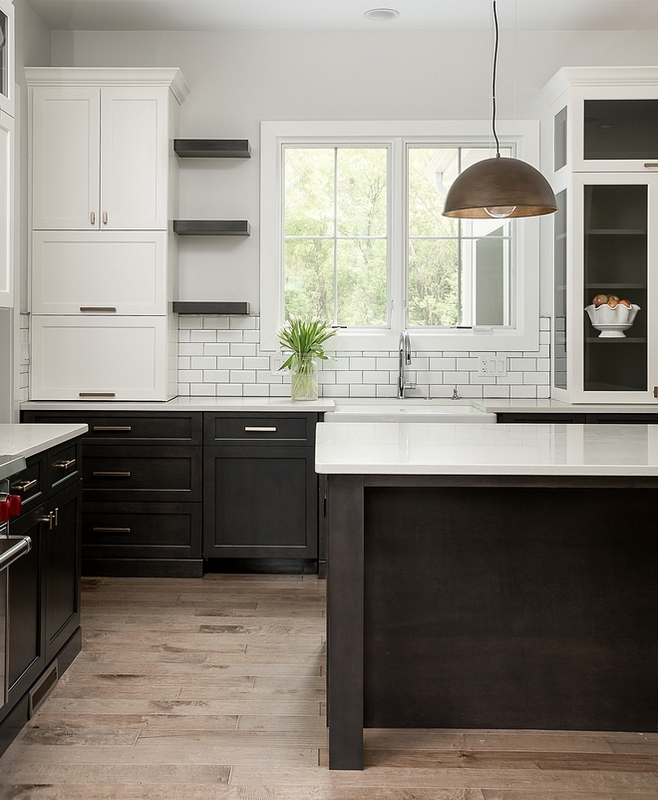 I love how the dark lower cabinets contrast with the white upper cabinetry. The hutch adds interest to the kitchen as well. Kitchen Faucet: Delta Single handle pull down kitchen faucet. 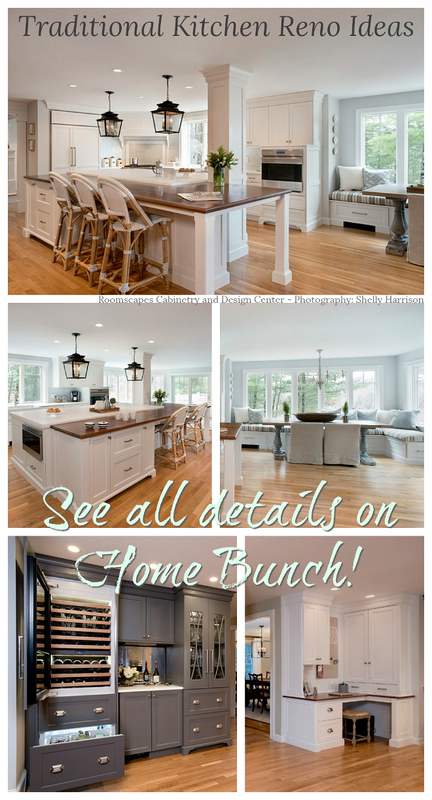 Hardware: Top Knobs Kingsbridge Knobs & Pulls. 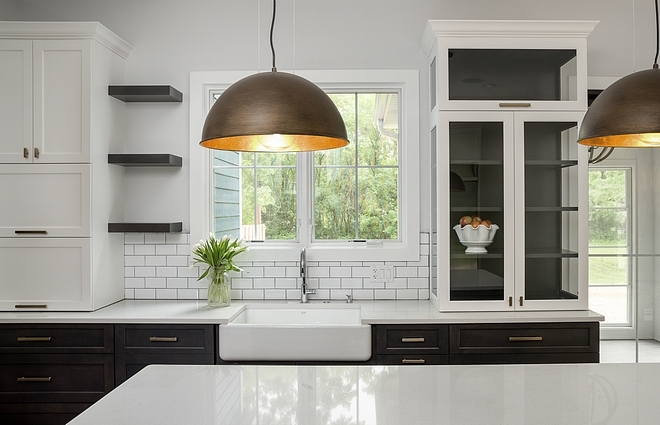 Lighting: Industrial Dome Shade Pendant- small – similar here & here. 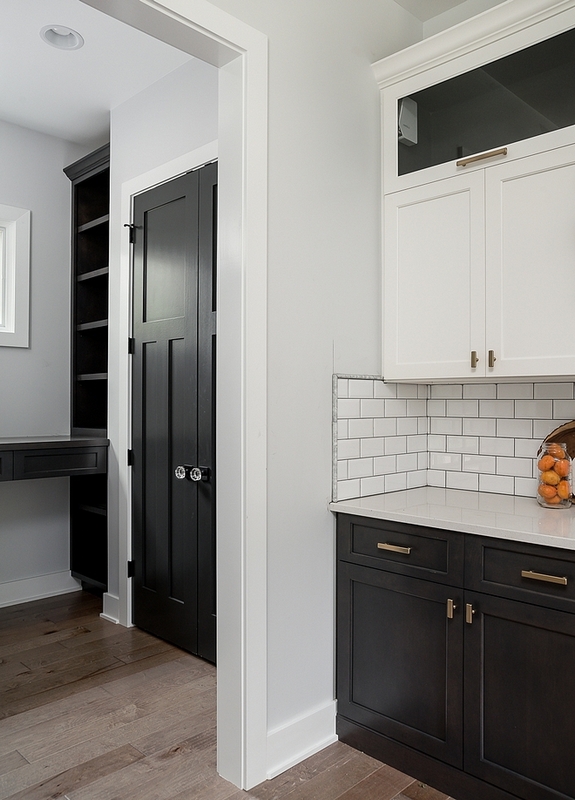 The kitchen opens to a small area with built-in desk and bookshelves. 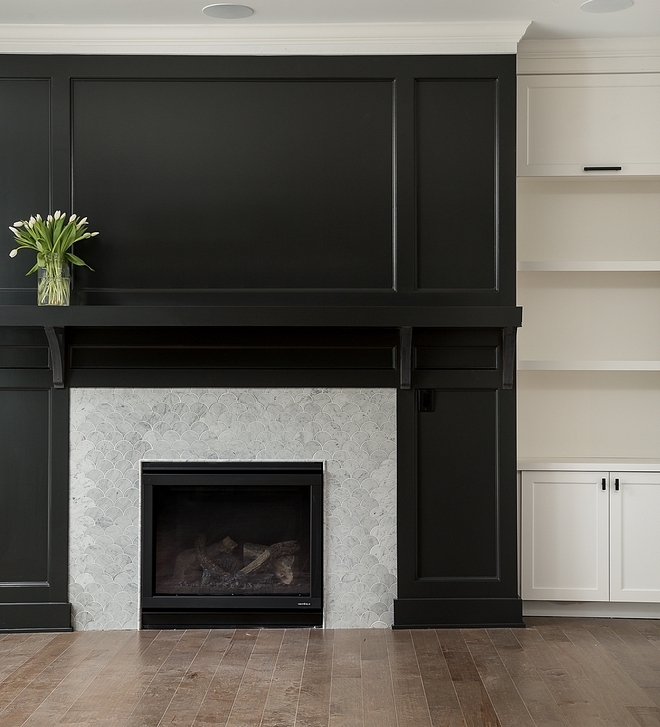 Fireplace Paneling Paint Color: Sherwin Williams SW 7674 Peppercorn. 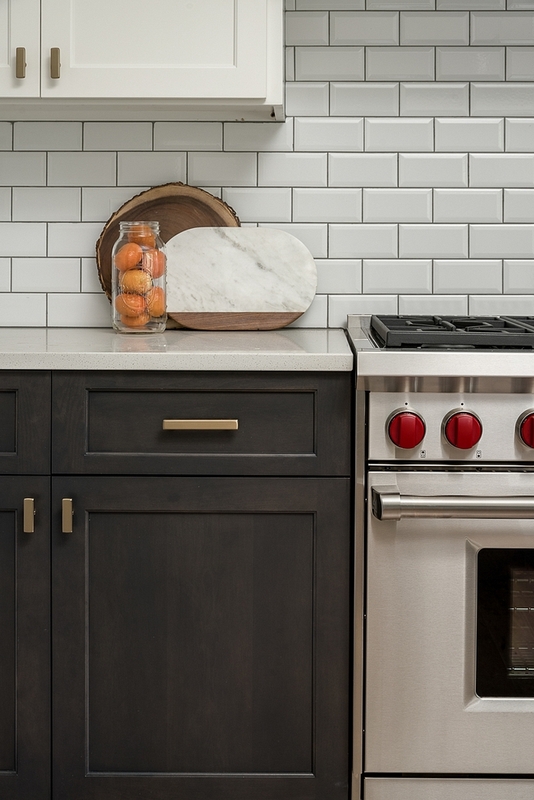 Similar Marble Scallop Fireplace Tile: Here & Here. This a way to impress your guests! 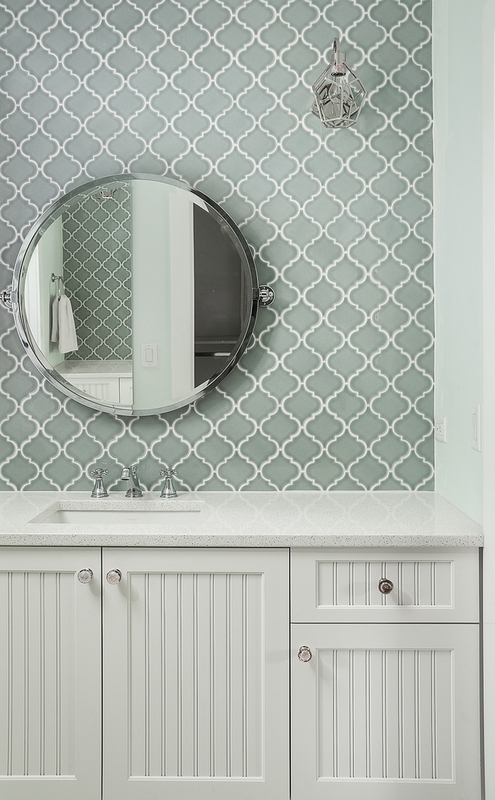 What a gorgeous powder room! 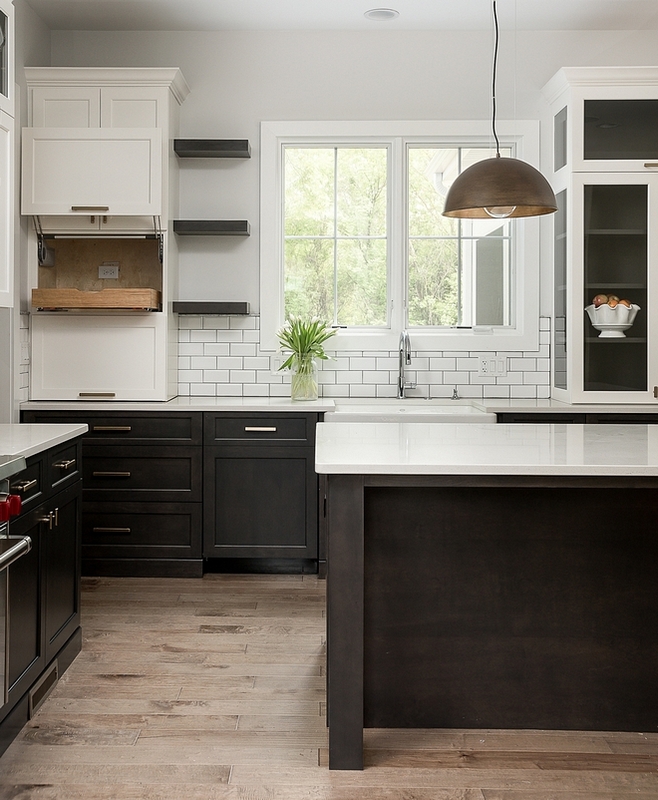 Cabinetry is Red Oak and countertop is Carrara marble. Sherwin Williams SW 6188 Shade Grown. 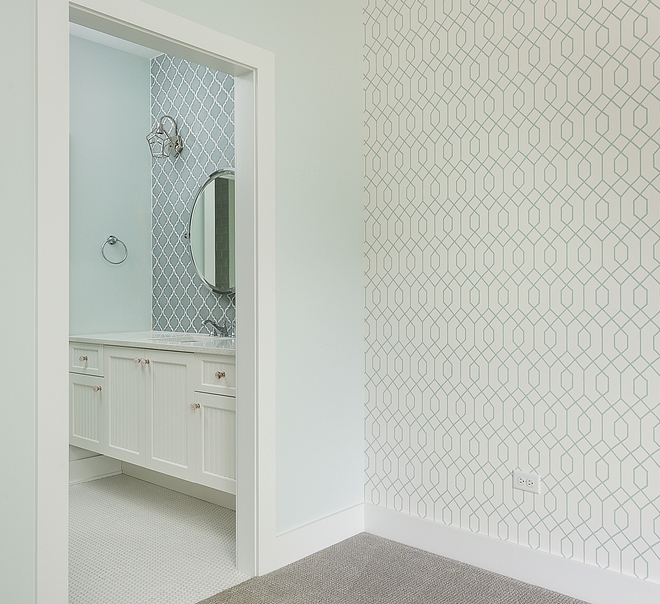 Wall paint color is Sherwin Williams SW 7636 Origami. Faucet: Moen Gibson two handle faucet. 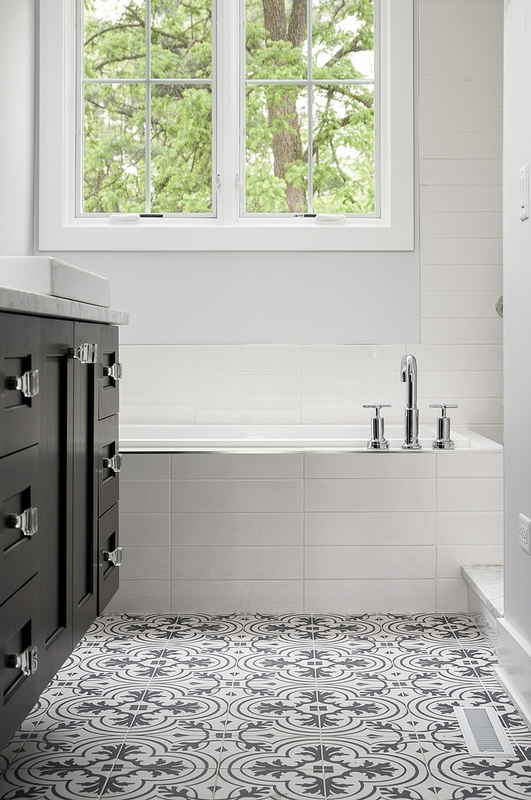 Floor Tile: White and black basket weave II Porcelain Mosaic. 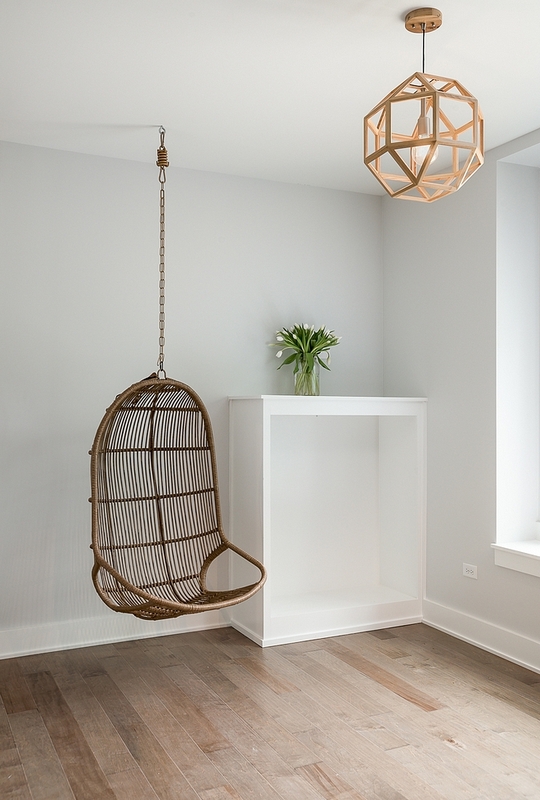 The upstairs landing features a fun swing chair and a built-in desk for three. Similar Swing Chair: here, here & here. 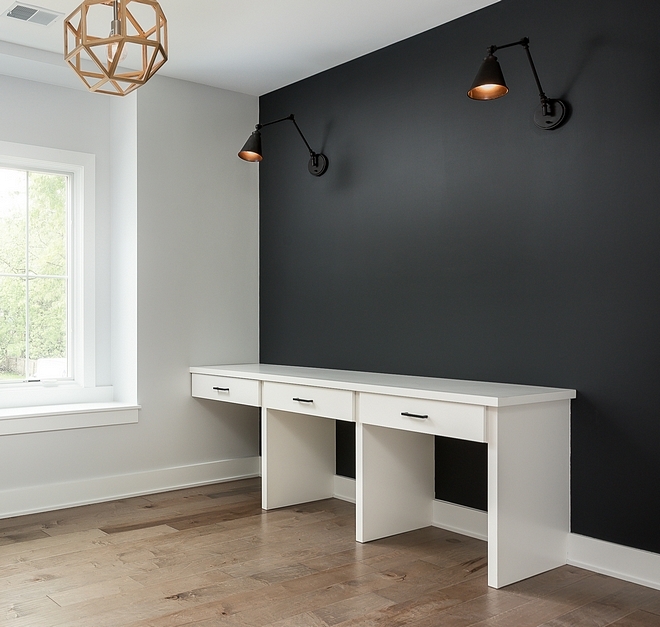 Accent Wall Paint Color: Sherwin Williams SW 7674 Peppercorn. 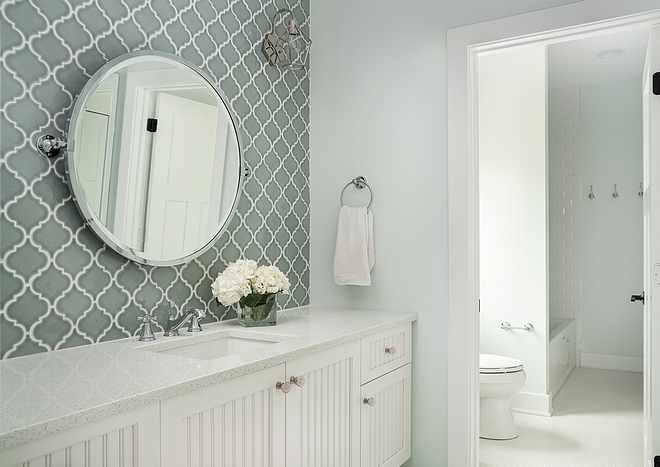 Site White by Sherwin Williams. 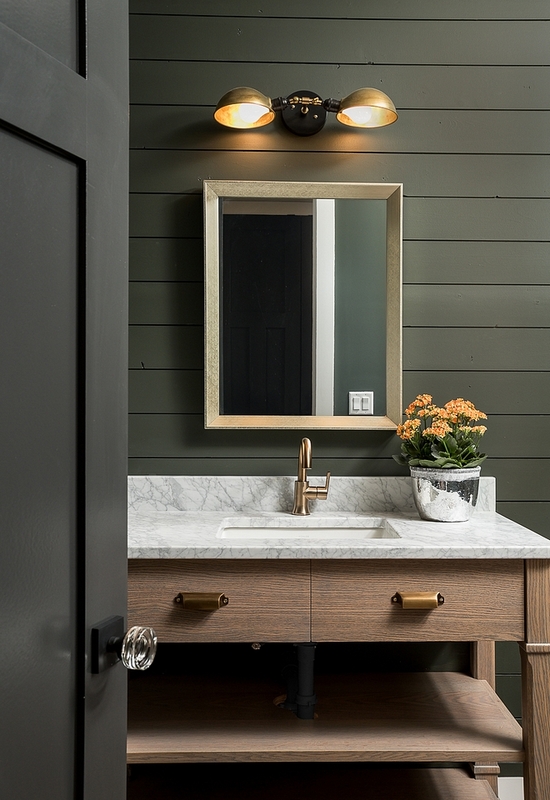 This boy’s bathroom features industrial elements and a floating vanity. 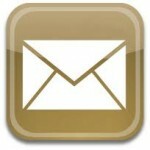 Faucet: Kingston Brass Concord wall mount twin cross handles sink faucet. Sherwin Williams SW 7014 Eider White. 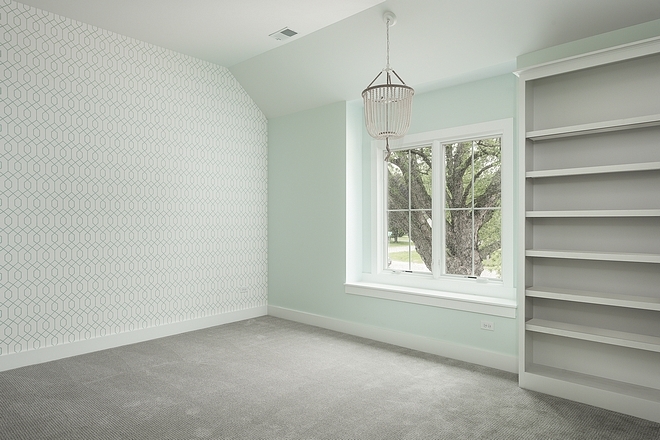 Sherwin Williams SW 6476 Glimmer. Beaded Chandelier: Joss & Main – on sale for $139. Recommended Wallpaper Sources: Here & Here. 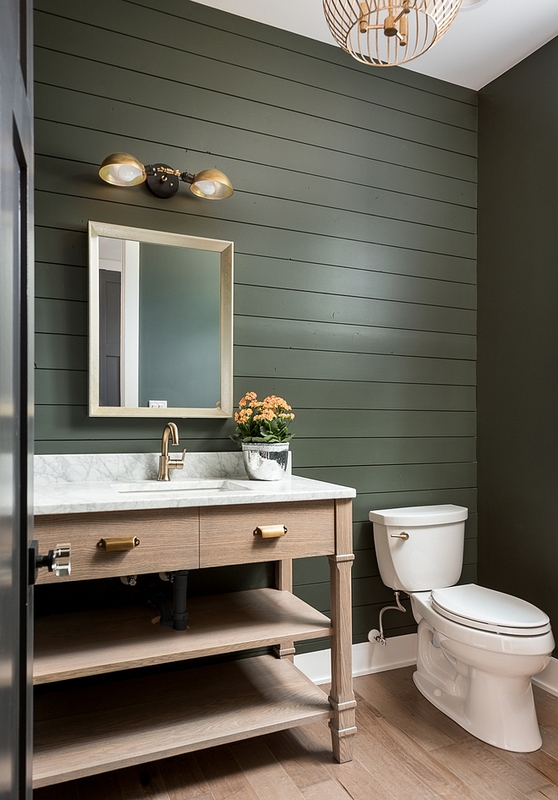 Jack & Jill Bathroom Paint Color (it can be for boys and girls): Sherwin Williams Glimmer. Cabinet is Maple painted Benjamin Moore White Dove. 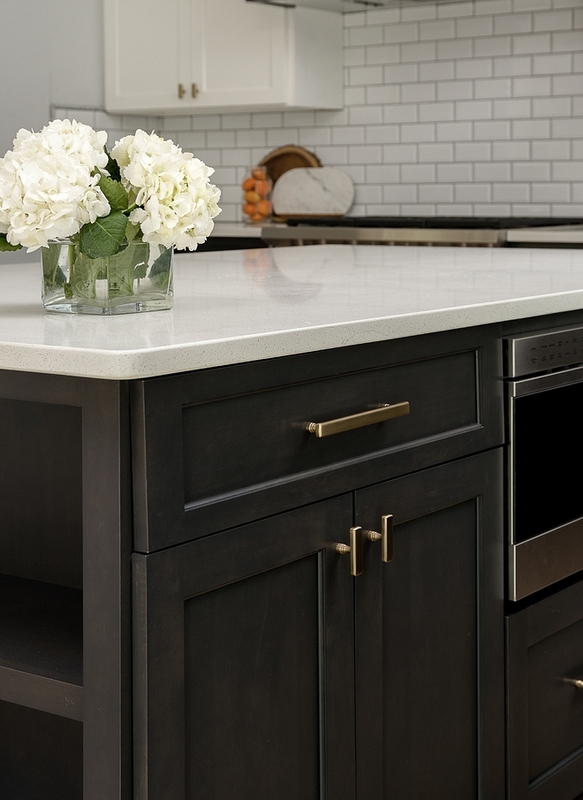 Countertop is quartz. 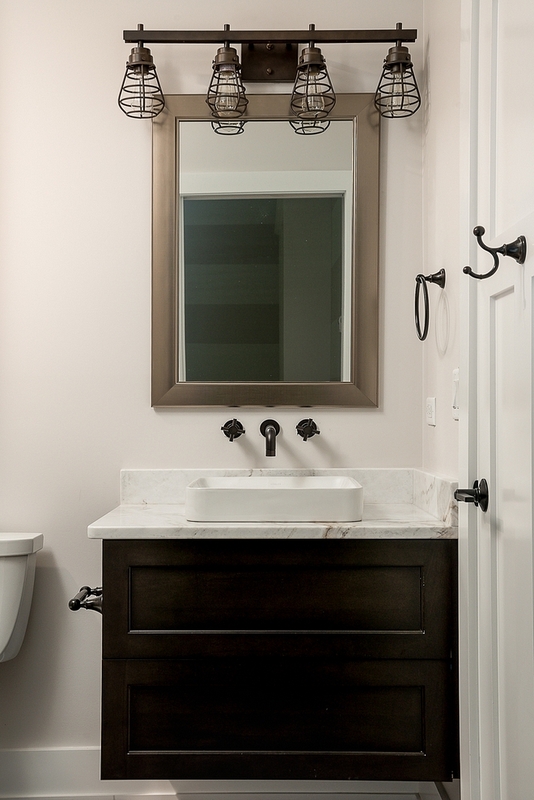 Faucet: Delta with cross handles. 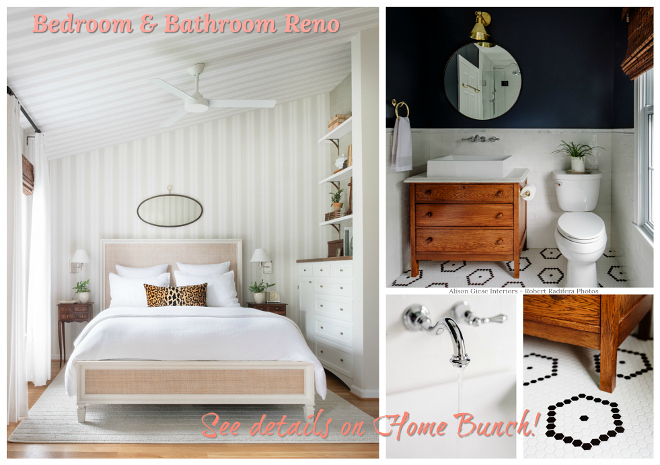 Cabinet Hardware: Anthropologie – similar here. 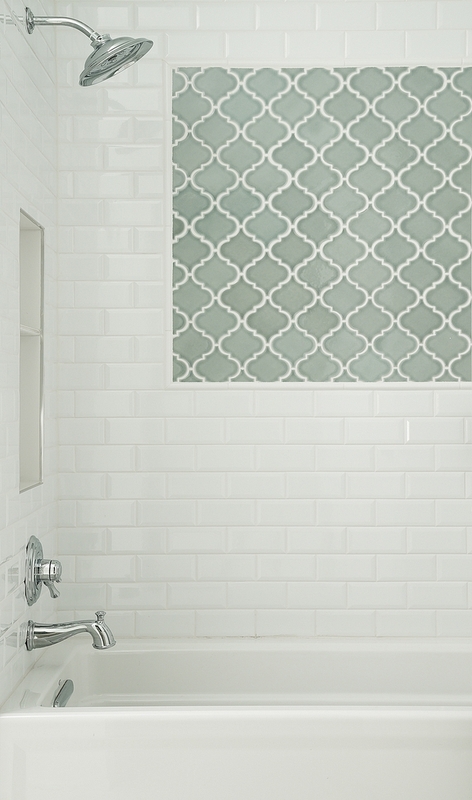 Tile: Beveled Tile 3″x6″. 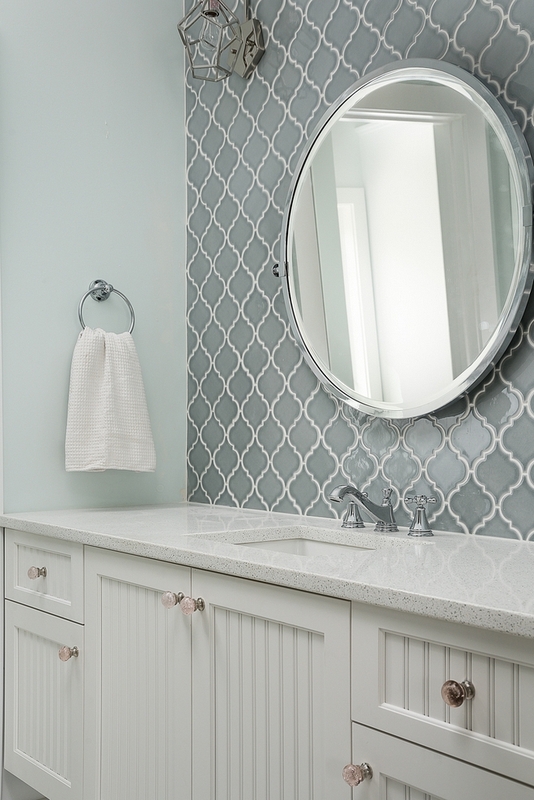 Accent: Villa Heirloom Arabesque Porcelain Mosaic. 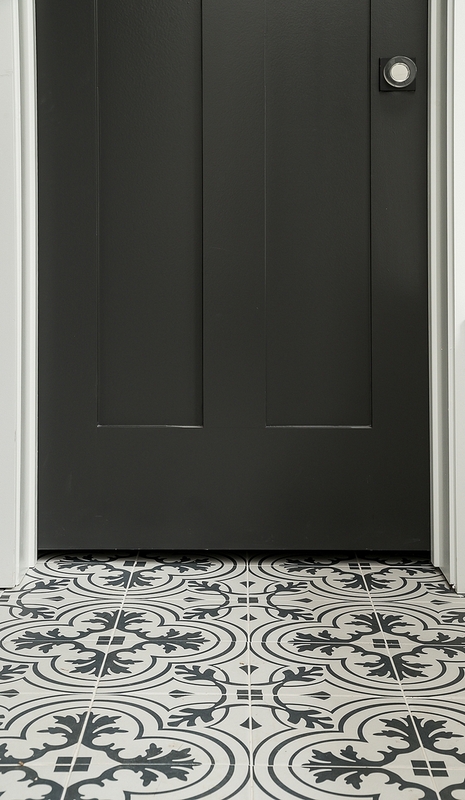 Interior Door Paint Color: Sherwin Williams Peppercorn. 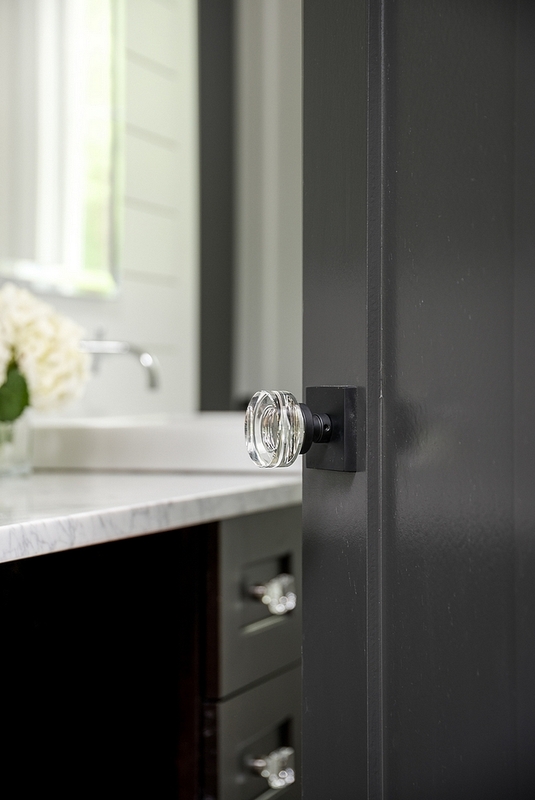 Door Knob: Emtek Modern Crystal. 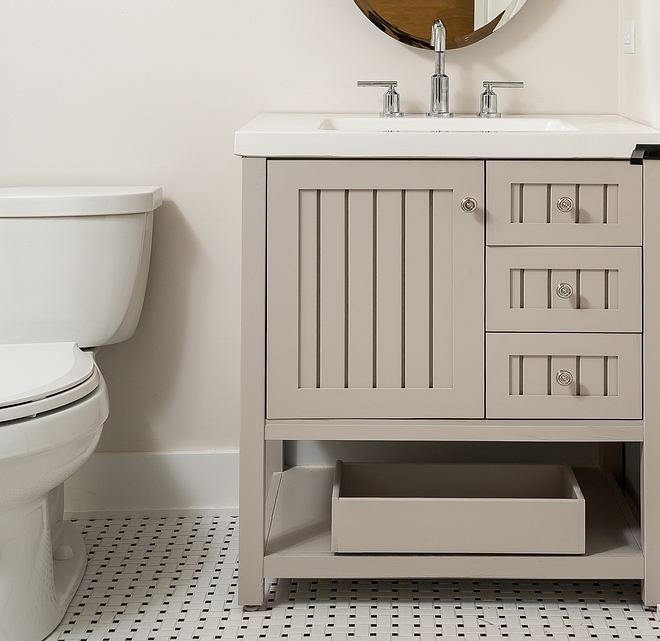 Master Bathroom Paint Color: Sherwin Williams SW 6231 Rock Candy. 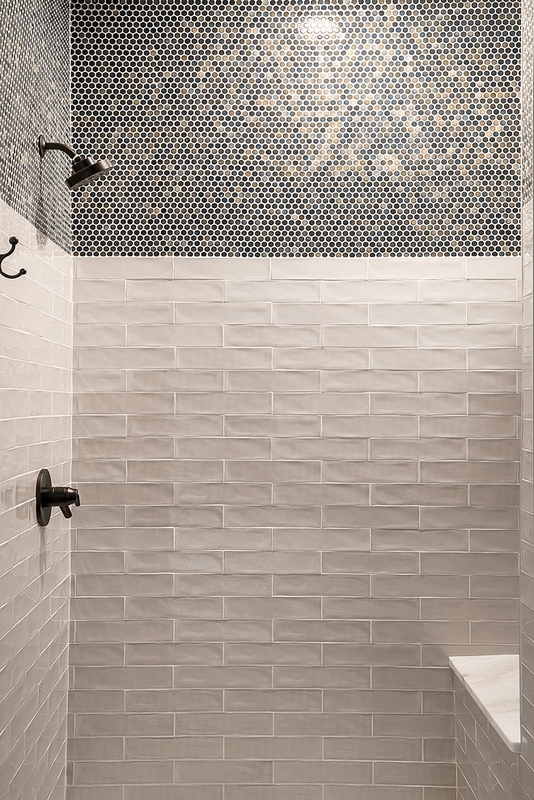 Wall Tile: Metro White Glossy Ceramic Wall Tile. 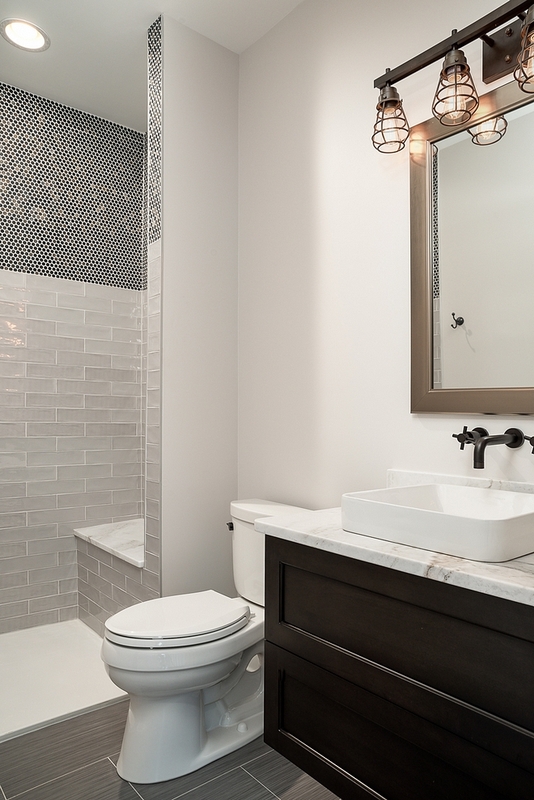 Floor Tile: Merola Tile Twenties Vintage Ceramic Floor and wall tile. 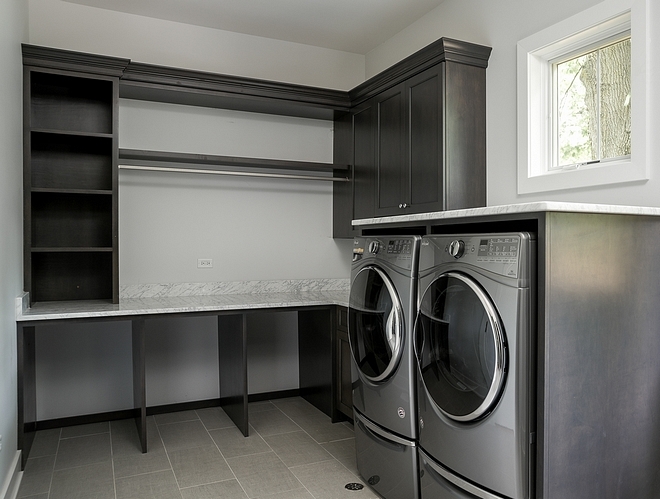 The laundry room features open space for hampers under the counter. 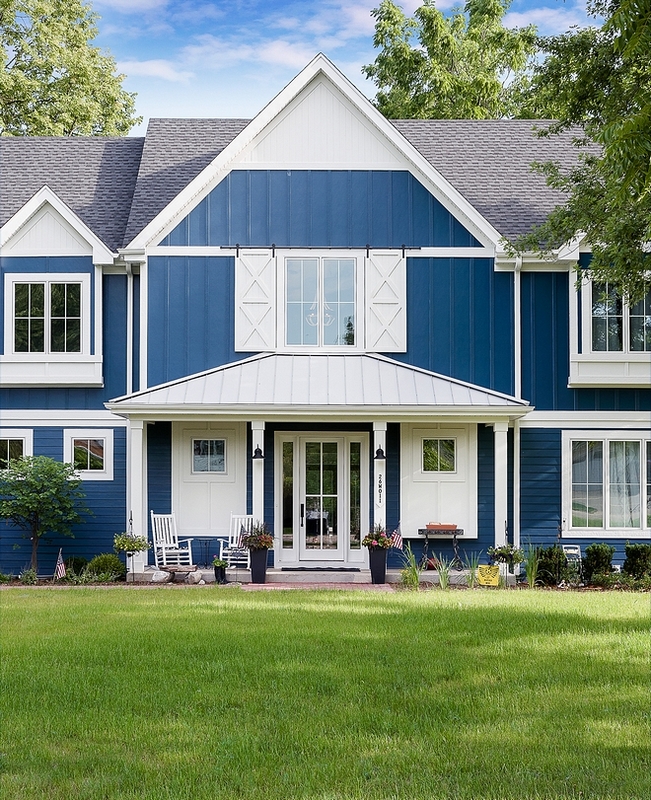 Paint color is Sherwin Williams SW 7070. 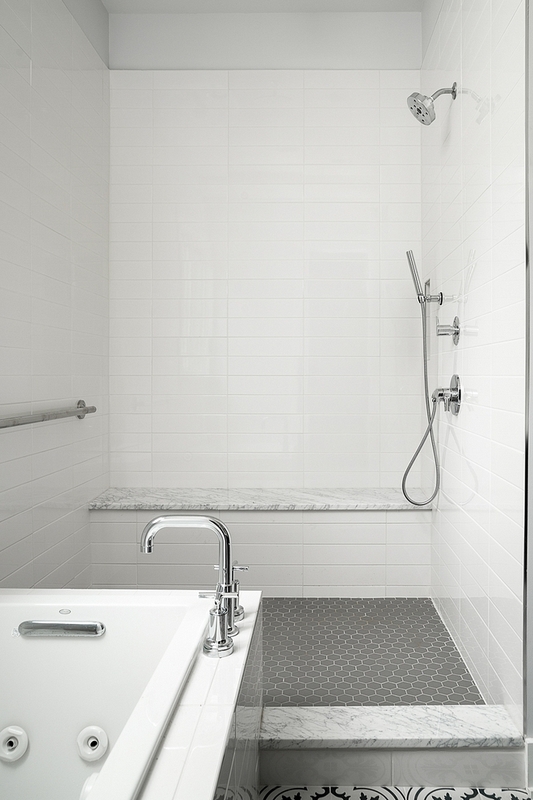 Floor Tile: Concrete Gray Ceramic Tile – similar here & here. Similar Chandelier: Here & Here. 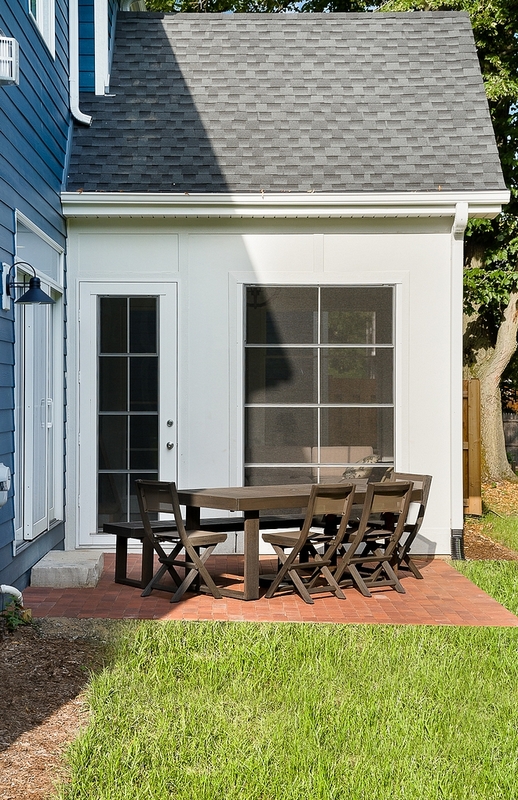 The sunroom opens to an inviting brick patio. 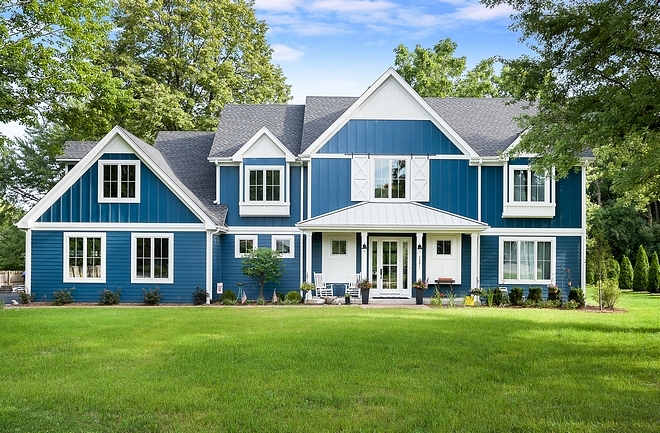 This beautiful blue exterior certainly makes this home stand-out!